First, we wanted to thank all of you who took the time to participate in our survey earlier this week. It was so wonderful to hear from you; we value your feedback tremendously! We have a lot of great things planned for you in the weeks ahead, and we’ll be sure to take your suggestions to heart. If you didn’t have the chance to participate and would like to do so, we’ll leave the survey open for a few more days (you can find it HERE). 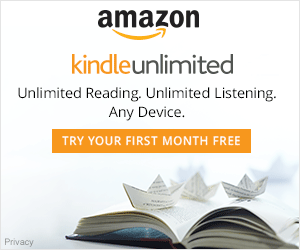 We have a fantastic FREEBIE for you in this week’s Sweet Reads Spotlight! 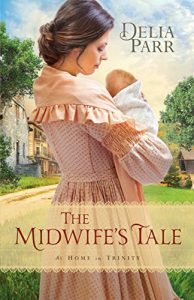 For a limited time, you may download The Midwife’s Tale, the first book in the At Home In Trinity series by inspirational historical romance author Delia Parr for free on Amazon! We’ll be back with the news on Book 3 of the Coloma Gold Rush series in a few days! I wanted to share my heartfelt thanks for your support of my brand new story, A Mail Order Bride For Franklin, earlier this week! Because of you, not only was this story able to hit the #1 bestseller spot in an Amazon category, but A Mail Order Bride For Daniel was able to saddle up next door in the #2 spot as well! Writing these stories for you brings me so much joy, and every day I give thanks for each and every one of you who takes the time to read them. Truly, I am blessed! I have a new clean Regency romance to share with you in this week’s Sweet Reads Spotlight. 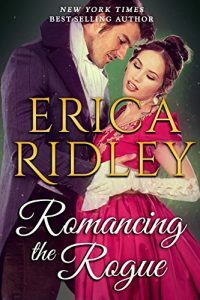 Romancing The Rogue, written by USA Today and New York Times bestselling author Erica Ridley, may be downloaded from Amazon for only 99 cents during the first week of its release! Wishing you all a wonderful weekend ahead! I hope my message finds you well today! Last week was quite busy for me, so I was grateful for the opportunity to rest and enjoy time spent with my loved ones over the weekend. Well, friends, today I’m thrilled to share that the second story in my Brides Of The Coloma Gold Rush series is now available on Amazon! This second story focuses on Sheriff Franklin McQueen’s search for love in the town of Coloma, California during the Gold Rush era. 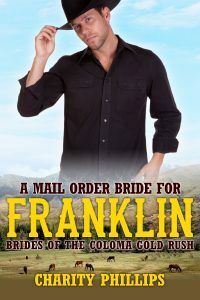 A Mail Order Bride For Franklin may be downloaded for only 99 cents, or at no additional cost if you already subscribe to the Kindle Unlimited program. Each of the stories in the series may be read in any order, but you might find it more enjoyable to start with the first story, A Mail Order Bride For Daniel; if you haven’t read it, you can find it HERE. Sheriff Franklin McQueen and his son, Geoffrey, work tirelessly to keep the town of Coloma safe from bandits and other nefarious villains. A few years prior, Franklin’s beloved wife, Gladys, passed away; now, the sheriff longs for a new wife on which to bestow his love and care–and with which he can better run his jail house. After placing an advertisement in the newspaper for a mail order bride, he begins corresponding with a young woman named Miss Louise Winchester. Remarkably, she is the spitting image of his late wife, and the two seem to be a perfect match. When Louise arrives in Coloma, however, things are not quite to her liking. She feels overwhelmed and out of her depth while helping in the jail house, and comes to believe that she may not be the right sort of woman for Franklin after all. When she finally begins to feel at ease, it turns out that one of the bandits has it in for her. Can Franklin keep his new bride safe from harm? ***This is the second book of the Brides Of The Coloma Gold Rush series. Each book within the series is a STANDALONE clean mail order bride romance story and may be read without having read the other stories first. I hope you enjoy Franklin’s story! In the meantime, I’d like to tell you about our friend Christian Michael’s new release in this week’s Sweet Reads Spotlight. 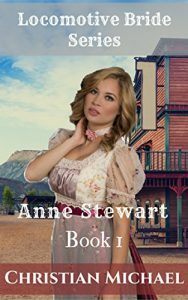 He has a new sweet mail order bride series called The Locomotive Bride, and for a limited time, you can read Anne Stewart, the first book in the series, for only 99 cents! Anne Stewart is a mail order bride who is eagerly preparing to make the journey across the country to be with her husband. They have been conversing for nearly a year, and she is eagerly anticipating starting her new life with him. But, Anne’s world comes crashing down when she discovers he has chosen another, leaving her penniless and alone in a strange city. Desperate, Anne is willing to turn to anything for help, and soon adopts a life of living as a vagabond, never staying anywhere for very long. When she meets a tall, dark, handsome railroad worker, Anne can’t help but fall in love. She’s willing to put everything on the line for the man she loves, but she has already endured such heartbreak, she fears what will happen if she does. Does this man share her feelings? Can Anne’s broken heart be mended? Can she survive the dangers of the railroad? 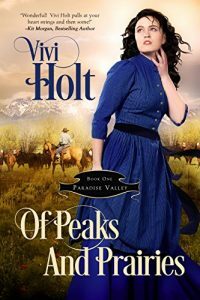 This week, Christian Michael is having a 99 cent sale on his Widows Head West Mail Order Bride box set, and Vivi Holt’s new book, Of Peaks And Prairies, is also 99 cents for a limited time! She’s married to a man she doesn’t love, and didn’t agree to marry. The scoundrel dragged her to the altar, and now everything is going to change. In a split second decision, she runs away, and stows aboard a chuck wagon that’s leaving on a cattle drive, heading north to Montana. She doesn’t know where she’ll go, or what she’ll do, she only knows one thing – she has to leave Fort Worth, Texas. 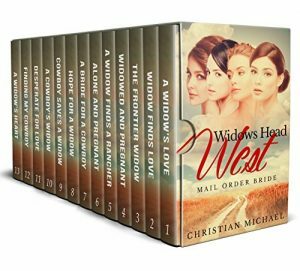 13 MAIL ORDER BRIDE stories from the Christian Michael catalog of WIDOWS who search for love in the Wild Wild West. Today, I’m excited to let you know that the first story in my brand new Brides Of The Coloma Gold Rush series is now available on Amazon! In this new series, we’ll be following the stories of four men and their quests for finding love in Coloma, California during the Gold Rush era. 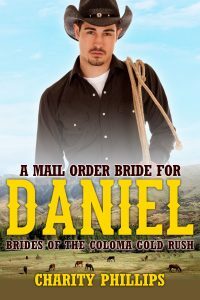 A Mail Order Bride For Daniel may be downloaded for only 99 cents, or at no additional cost if you already subscribe to the Kindle Unlimited program. Daniel Bishop is a handsome and kind miner of coal and gold in Coloma, California. Though his work is thrilling and he has made a fortune in gold, there is one thing he is desperately missing: a wife with which to share both his life and riches. He has been writing letters to a sweet and feisty young woman named Hannah James, a jewelry store clerk in New York, and she is eager to join him out West to embark on an exciting new start. Their connection simply through their written correspondence is so true and strong, that no question remains in Daniel’s mind that Hannah is the perfect woman for him. He promptly sends along a train ticket and excitedly awaits her arrival in Coloma. When she arrives, their chemistry face to face proves to be as strong–if not stronger–than it had been through their letters, and soon, they decide to begin their lives together as husband and wife. Problems arise when Hannah raises her desire to continue selling jewelry as she had back East. Daniel, out of concern for her safety, initially tries to discourage her due to the fact that the town is known for its history of run-ins with bandits. One day, while Daniel is away working, Hannah attempts to go mining on her own, and due to her lack of experience, she finds herself lost in a deep, dark cave. Will Daniel be able to save his new bride from danger, and if so, how can he ensure her safety while helping her fulfill her lifelong dreams?